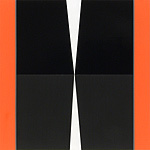 Don Voisine is well-known for his abstract oil paintings that explore sculptural and architectonic spatial vocabularies. 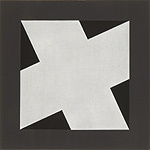 He has long worked in a reductive language of overlapping geometric shapes, rendered in contrasting tones of matte and shiny blacks set against lighter grounds. The works are bordered by brighter bands of color top and bottom or at the sides, and are frequently accentuated with narrower lines of color that provide movement as well as optical vibrancy. In some of the newer works, light grounds have been abandoned entirely, with all-black tonalities used to define the interior space. Directional brushwork enhances the contrasts, as well as the use of varying under-colors beneath the black fields. 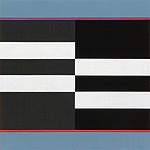 In other works, black is replaced by cream, white, and grey, or contrasting fields of red. 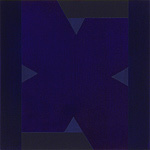 For this show, a deep ultramarine blue expands the artist’s typical color palette, lending a translucent quality to the weight and solidity of the geometric forms. Taut, elegant, and severely sensuous, Voisine’s paintings are remarkable for their monumentality at every scale, as well as for the rich variety of investigations the artist pursues within his reductive language. The geometries in many of the paintings are symmetrical, with forms crossing and overlapping, and in the largest-scaled painting, adjacent shapes repeat, rhyme and mirror one another across zones of light and dark. In other works, tension is created by tips of trapezoids nearly coming into contact. Meanwhile, the shapes are bisected into matte and gloss zones, creating an illusion of folding in space. 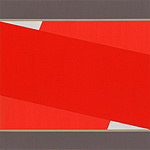 In still other paintings, unbalanced or diagonal elements provide a sense of tilting, rotation or falling movement. Asymmetry comes into play both in the shape of the forms and in the way they rest on their grounds, imparting weight, movement and establishing a deep pictorial space.